Source: ARTBA analysis of McGraw Hill data for January to August 2014 compared with January to August 2013. Weighted with the ARTBA Price Index that takes into account material prices, wages and inflation. 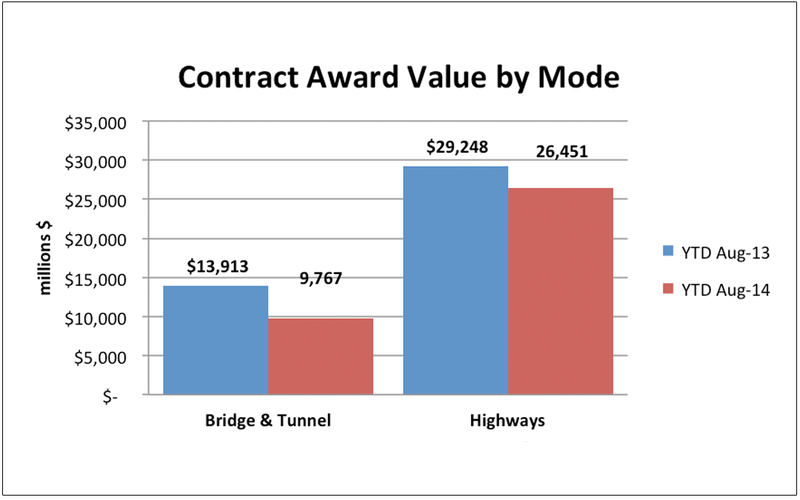 The real value of highway and bridge contract awards was down 16 percent in the first eight months of 2014 compared to last year, according to ARTBA analysis of data from McGraw Hill. State and local governments awarded $36.2 billion in highway and bridge work between January and August 2014, compared to $43.1 billion during the same time period in 2013, when adjusted for material costs and inflation. The latest data indicates that the slowdown we have seen throughout 2014 is continuing into the peak of the summer construction season – state and local governments put out most of their awards in August and September. The slowdown is widespread, with 27 states awarding fewer highway and bridge contracts by August 2014 than they did a year ago. Awards were up in 17 states and Washington, D.C., and programs were fairly flat in eight states, either up or down within five percent. State and local government contract awards for airports were up 32 percent and railroad and mass transit contracts were up 45 percent. Contract awards for docks, piers and wharves were down 26 percent. However, government spending represents a smaller share of these transportation construction markets. The real value of all transportation contract awards from January to August 2014 was down 11 percent compared with the year before. Contract awards are a leading indicator of future work in the industry as projects get underway. Detailed data by state and mode is available as part of ARTBA’s market subscription reports. For more information, contact ARTBA’s Lital Shair.